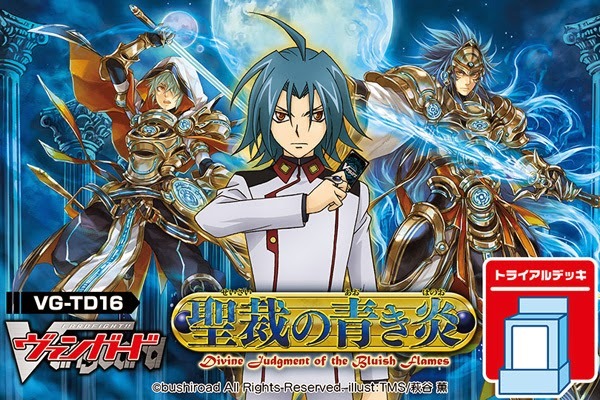 Divine Judgment of the Bluish Flames and Will of the Locked Dragon respectively, allowing players to play using the debut decks of two members of the Elite Four, ahem, I mean Quatre Knights from the fourth season of the anime, Olivier Gaillard and their recently converted-to-evil leader, Aichi Sendou. To sum up the 2 TDs, they are of course meant to be playable out-of-the-box for beginners as how TDs always are, but considering that they are based on the existing Liberator and Star-vader archetypes established the previous season, these TDs serve to introduce a few key cards that allow them to do what they usually do faster and more reliably, namely more cost-efficient superior calling for Gold Paladin (not so much extra focus on power increments this time round) and the lock that has become synonymous with the nefarious Link Jokers. However, these decks’ main point is still Legion, the name of the game status quo, hence they will also provide the debut for the Legion pairs in each clan and cards that support/benefit from a Legioned vanguard. [AUTO]: Forerunner (When a unit of the same clan rides this unit, you may call this unit to (RC)) [AUTO](RC): When this unit boosts, if the number other vanguards and/or rear-guards you have with "Liberator" in its card name is four or more, the boosted unit gets [Power]+3000 until end of that battle. 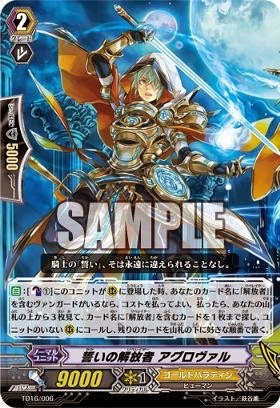 Bushiroad is nowmore generous for the TD’s starter vanguard. In past TDs, our dear publisher usually throws in a vanilla G0 as a starter that you will eventually scrap and buy a better unit in replacement. But for the first time ever, the TD comes with a Forerunner that essentially becomes a grade 1 8000 vanilla booster. The condition is extremely easy to achieve,considering that Gold Paladin emphasizes on filling as many Rearguard slots as possible. So as long as your backrow is full, the extra +3000 is yours. 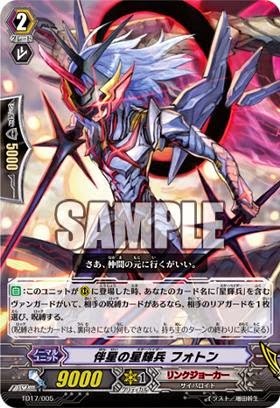 [ACT](VC): Legion 20000 "Liberator of Oath, Aglovale" (If your opponent has a grade 3 or greater vanguard, only once, this unit may return four cards from your drop zone to your deck, and search your deck for the specified card, and perform Legion.) [AUTO](VC):When this unit performs Legion, look at four cards from the top of your deck, search for up to one card with "Liberator" in its card name, call it to an open (RC), and put the rest on the bottom of your deck in any order. [AUTO](VC):When this unit attacks a vanguard, this unit gets [Power]+2000 until end of that battle. 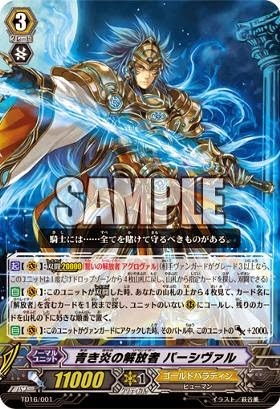 Percival is the trump card of the deck similar to other TD-trump cards that usually usually give Power boosts or superior calling effects like the Great Silver Wolf Garmore. Looking for 1 unit among the top 4 upon Legioning for free is an average-good effect and the odds of you pulling an attacker or booster that you need is high. 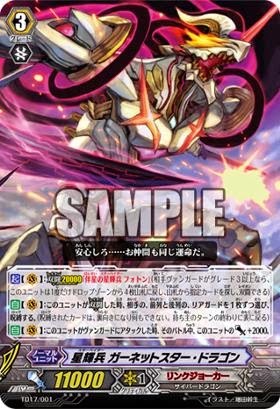 [AUTO]:[Counter Blast (1)] When this unit is placed on (RC), if you have a vanguard with "Liberator" in its card name, you may pay the cost. If you do, look at three cards from the top of your deck, search for up to one card with "Liberator" in its card name, call it to an open (RC), and put the rest on the bottom of your deck in any order. Percival’s legion partner. 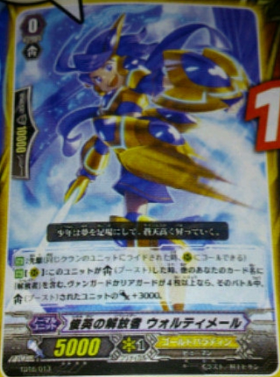 If not used as such, Aglovale being called onto the rear-guard is a low cost way of increasing field size and you get to choose from the top 3 cards of the deck at a low cost of CB1. This card will become a splashable seen in most GP decks. [AUTO]: Forerunner (When a unit of the same clan rides this unit, you may call this unit to (RC)) [AUTO](RC):When this unit boosts, if the number of locked cards your opponent has is two or greater, the boosted unit gets [Power]+3000 until end of that battle. A starter capable of forerunning like the one in the GP TD. Its power gain, however, is not as reliable as his GP counterpart since you need 2 locked cards on the opponent’s side of the field. Moreover, this deck, being so Legion-centric, offers very little opportunities for locking in the first place. The only times you Lock with this deck is when you Legion or if you decide to call your single copy of Photon as a rearguard, so tough luck trying to maintain weak Quantum’s +3000. Even if this card is used as a starter in other LJ decks, the +3000 might be harder to achieve until mid-game when you have access to grade 3s that possess more certain lock effects, but by then you are better off retiring this puny G0 and replacing it with an actual 8000 vanilla or 7000-power-with-effect booster. 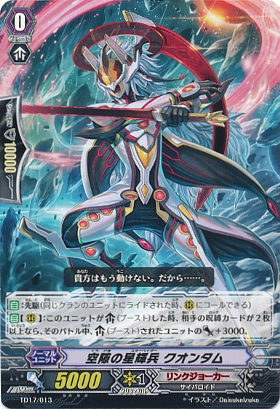 Assume Photon to be the new Blaster Blade of sorts, the new G2 signature of Aichi’s that has a disruptive effect on the opponent’s side of the field a la Blaster Blade’s retiring. This card is close to giving the you a free Lock, usable almost anytime in-game, as all you need is to call it as a reagruard, which is more reliable and has even fewer strings attached than Dust Tail Unicorn and the Infinite Zero Dragon breakride. Sadly, with all good things in the TD, only 1 copy is included, but forsee this card to become a new staple to both new and old Link Joker decks like what Blaster Blade is to the Royals. The boss of the deck, basically a Legion version of Infinite Zero Dragon, which locks 2 cards on the opponent’s side of the field, one from the front row and one from the back. ACT](VC): Legion 20000 "Companion Star Star-vader, Photon" (If your opponent has a grade 3 or greater vanguard, only once, this unit may return four cards from your drop zone to your deck, and search your deck for the specified card, and perform Legion.) [AUTO](VC):When this unit performs Legion, choose a rear-guard from your opponent's front row and back row, and lock them. (The locked card is turned face down, and cannot do anything. It turns face up at the end of the owner's turn.) [AUTO](VC):When this unit attacks a vanguard, this unit gets [Power]+2000 until end of that battle. LJ also received their first Especial Intercept in this TD, though we’re putting this to the back of our head as we rarely see use of the +5000 shield of this breed of G2s these days. Since Legion is the new thing, a significant portion of the remaining cards that gain power increments when your Vanguard is in Legion. Each deck also has the “budget” Legion only there for the “+5000 when attacking” power increment which competitives will phase out. The remainder of your deck is your standard TD fare: straightforward “french vanilla” cards with simple effects or small power increments. You will definitely be throwing away the 7000s that gain 1000 with CB1 and in come the Sentinels or the other G1s that you have been using. I feel disappointed that Busiroad decided to dump in these 7000+1000s when they could have just printed 8000 vanillas like what they always did for previous TDs. So, how worth it are the 2 TDs? If this is the first time you are playing Liberators and Star Vaders, sadly you might not get much of the feel of these two clans’ traits because the superior-calling theme and Locks do not show much here - the only time you can do it with this TD is with the Legion components. TDs 16 and 17 are more about the Legion and generic power increments with the cards that support/gain effects when your Vanguard is Legioned than showing off what the clans are really unique at. However, if you are an existing user of the said clans, you are most probably grabbing a copy just for the Legion couples and the better support cards that I have highlighted earlier. Most of the triggers and vanillas are mere reprints of the previous Liberator and Star-vader TDs which you will relegate to your common-and-rare scrap trunk. And as with the recent TD bosses, do not count on them to win that many battles if you stick to using them as your main vanguard till the end of the battle, especially if you are a veteran or the competitive-minded. 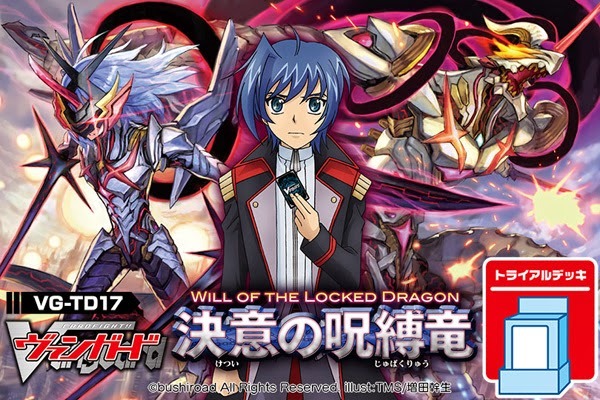 Moreover, at the point in time of writing, some of the cards in BT17 have already been revealed, including potentially stronger ace cards that Aichi will be using in the coming episodes of the anime. These new cards might easily overpower your the Legion couples you’ve just obtained from the TD. You might hold your horses and switch over to those if your wallet permits. Furthermore, there is also the Neon Messiah Deleter Deck used by Ibuki in the upcoming movie with the enigmatic Delete mechanic, which may prove to be a better Link Joker deck compared to Aichi’s. Gold Paladin and Link Joker will remain as relatively popular clans as it has always been for clans used by main characters in the anime. Furthermore, trends for the new and much-hyped Legion mechanic do not seem to be particularly detrimental towards any clan, unlike Locks which are a significant threat to decks that require a full field to function properly. LJ dominated the previous season because of the varied playstyles that they can achieve with Lock, which is not a mere stalling of attacks but from which, further injuries to the insult, such as chain-locking more cards or retiring Locked units, can be added. Of course, not to forget the amount of complaints we’ve heard over the feared Chaos Breaker Dragon. As for GPs, they have been around since Season 2 and will continue to be a clan favoured by entry- to intermediate- level players due to their heavy promotion in the anime and the easy-to-pilot nature of a clan that focuses on straightforward power increments and top-calls. BT17 will bring upgrades to these clan soons in a month from now, but until then, enjoy Legioning with these two TDs for now.